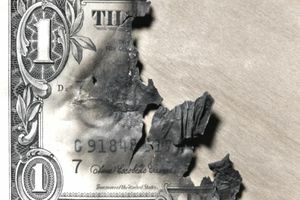 This article was originally written in 2010 when the United States stock market had only barely begun to recover from the collapse that hit a low in March of 2009 following what was the worst economic meltdown since the Great Depression in 1929-1933. Perfectly wonderful companies were being sold for prices that were demonstrably cheap from the perspective of a rational private investor. It is archived to preserve the integrity of the message with this introductory text added to give you context for why it was written so strongly at the time as people liquidated their retirement savings and began swearing off investing in stocks or other securities. In what has become an annual rite, the day after Thanksgiving, which marks the official start of the Christmas shopping season, Wal-Mart, Target, Best Buy, and other retailers announce massive discounts on televisions, video games, and toys. Excited by these crazy prices, otherwise rational people spend the entire night camping on the sidewalk, in freezing weather, waiting to make a mad dash for their favorite department when the doors open. Imagine a world where these customers ran out of the store whenever the merchandise was put on sale. They ran screaming to their cars, saying they needed to go home and return their previous purchases, now at a much lower price, because the cost of DVD players was falling! You would likely mumble something about these "idiots" as you fought the crowd to get into the store to buy everything you could, while prices were low. As soon as things stabilized, you know you could likely put them up on eBay for a tidy profit. Yet, this bizarre scenario is what plays out nearly every single time we have a market crash. Since I began writing my investment articles 10 years ago, we have lived through at least two major stock crashes (the post-September 11th low and the credit crisis that followed the collapse of Lehman Brothers). Each and every time the stock market or the bond market goes south, which is an inevitability in life (peaks and valleys are more common than a constant, upward trend), you have heard tales of ordinary investors dumping their 401(k) holdings, selling off their Roth IRA investments, and moving everything to cash. In fact, during the worst of the market crash between 2008 and 2010, so many investors were parking money in Treasury bills instead of taking advantage of the low prices available on stocks and corporate bonds that there was an actual moment in time when Treasuries were yielding a negative return and investors were still buying them as quickly as they could, so great was the fear and panic. Here is an unfortunate truth: If the American stock market becomes worthless, you won't have a job. If you are decades away from retirement, do you really think that the United States as a whole will be worth less money thirty or forty years from now? Seriously? I don't believe that. The Internet in its current form barely existed 20 years ago and yet now represents a substantial portion of our overall economy. Technology and innovation will continue to transform business and nations. That means that if you are smart enough to know you don't know how to invest and put your money into a low-cost index fund that buys the biggest companies in the nation, you take advantage of matching funds by your employers on any 401(k) contributions, and you dollar cost average so that you are buying constantly to average out the price you pay for your shares, history has shown that you are statistically likely to do very well over several decades. A 20-year-old who was unfortunate enough to invest at the height of the Great Depression in 1929 would have recovered far sooner if he or she were constantly buying stock during the collapse because their cost basis was so much lower. *In 2016, the value of a single share of The Coca-Cola Company with dividends reinvested has now reached between $10,000,000 and $15,000,000. While this is not indicative of the returns an investor could earn going forward - many great businesses ultimately fail - it demonstrates the power of owning a business with great economics over long periods of time regardless of volatility in the market price of the common stock, which is the central thesis. Please note that The Balance does not provide tax, investment, or financial services and advice. The information is being presented without consideration of the investment objectives, risk tolerance or financial circumstances of any specific investor and might not be suitable for all investors. Past performance is not indicative of future results. Investing involves risk including the possible loss of principal.